In recent weeks we’ve come to know and love Harrison Crow’s Lowered Expectations series, where he takes a look at the best open play shot attempts that did not end in goals. This new series, Setting the Table, will look at the highest quality chances created, focusing on those that did end in goals. Each week, we’ll share the top five assisted goals and break down how they happened. I love this chance because in a spot where most players would probably try to control the ball and volley a shot from a bad angle. Darwin Quintero instead takes a simple touch to control the ball and then flicks it back across goal, where both Christian Ramirez and Miguel Ibarra are goalside of their defenders and fairly open. It looks a bit fluky, but I think it’s actually a great bit of skill, patience, and vision from Quintero to set up this goal, something the Loons will be counting on more of from their first ever designated player. It also may be an instance of Quintero’s effect on opposition defenses, as both Roman Torres and Kelvin Leerdam are guilty of ball-watching and allowing Ramirez the space to head the pass home. This assist from Ilie Sanchez didn’t generate the highest xG chance of the weekend, but it might be the most impressive. Sanchez’s pass is played perfectly into the path of Yohan Croizet, so perfect that one touch with the outside of his foot puts it in the back of the net. It’s a great run from Croizet, and nobody on the Vancouver back line reacts quickly enough to put any real pressure on the shot. This movement is a clinic in winning the ball back and shredding a team on the counter. Mohammed El-Munir wins the ball after an errant touch from San Jose, and two quick passes later Justin Meram plays a perfect defense splitting through-ball to Dom Dwyer, whose perfectly timed run is aided by the fact that neither Earthquake center back seems to know he’s there until too late. Meram’s ball is perfectly weighted to split the defense and allow Dwyer to touch the ball past Andrew Tarbell and shoot into an open net. The pass to Meram is key, as it gets him into the space between San Jose’s midfield, which is pushed forward after being on the attack, and the back line, which didn't close that gap quickly enough. The back line manages to give Meram space, while also losing Dwyer, setting up this chance. Yohan Croizet gets credit here for setting up Cristian Lobato’s goal with a mixture of a nice move and a bit of luck. Say what you want about a lucky deflection, Croizet leaves Felipe in the dust (not that Felipe looks to try too hard to keep up) and plays the ball into the six, where anything can, and in this case does, happen. Most of Vancouver's defense actually does a decent job here, with the exception of Felipe and Alphonso Davies, who makes almost no attempt to track Lobato, leaving him all alone to head home Croizet’s deflected pass. The highest quality chance of the week, assisted or unassisted, comes on this pass from Chris Mueller to Sacha Kljestan. It’s not the most difficult of assists, but certainly one that’s been missed plenty of times. Yoshimar Yotun deserves praise here as well for playing Mueller into so much space, as do the Earthquakes for basically vacating the left side of the field to give Mueller that much room to roam. It’s worth noting that these were the top five assisted chances according to expected goals over the weekend. There were a handful of chances that were unassisted and had higher expected goals. Some were penalties, some rebounds, and this Latif Blessing goal that Evan Bush will want to forget had the second highest expected goals of the weekend at 0.881 xG. We’ll finish off with the biggest saves of the week based on our Keeper xG model. Andrew Tarbell wins this week with his save of Justin Meram’s penalty that had a Keeper xG of 0.969. A nice moment from Tarbell in an otherwise forgettable game. Jimmy Maurer gets credit for the biggest save from open play for the second save in his huge double save against Philadelphia. 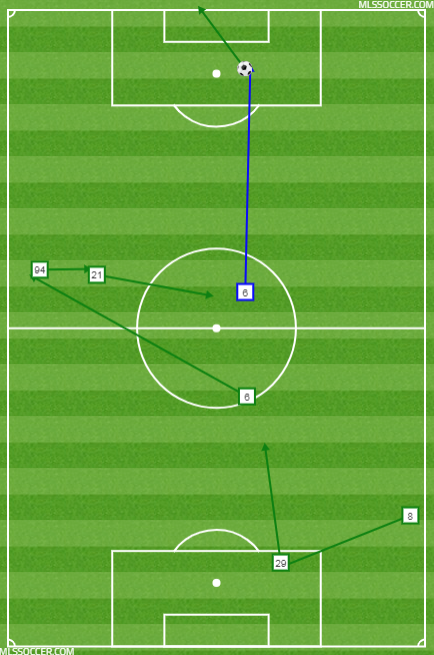 After stopping David Accam’s shot, Maurer denies CJ Sapong on this chance that had a keeper xG of 0.928. Good game Jimmy. That's it for Setting the Table this week, thank you for creating this chance for me to share these created chances with you.